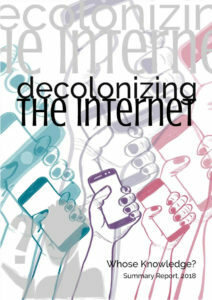 In July 2018, nearly 100 people gathered to share a two-day space in Cape Town, in a quest to discuss and strategize around decolonization, knowledge, and the internet. From techies to artists, our Decolonizing the Internet conference brought together a wide array of people from 28 different countries, all of whom care deeply about the politics of knowledge production and internet governance. A majority of participants were women, transgender or non-binary, people of color, and from the global South – embodying the plurality of knowledge from a variety of contexts across the globe. This report shares more about what happened at this event. It provides an overview of the process itself, which was designed as a conference for talking with, rather than talking at; some themes, visions and goals that shaped the debates; actions that emerged; next steps for the future; and reflections from participants.